Join San José in creating world-class streets and a premier bicycling network. Cities around the country have shown that downtown bikeways can create safe and sustainable movement, linking residents of all neighborhoods to economic opportunity, and making streets into better public spaces, block by block. 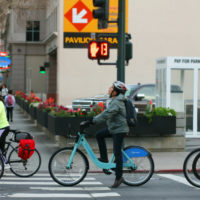 With major transit investments, bike share expansion, a Vision Zero goal, and sustained growth in the city’s core, San José is at an inflection point. The opportunity to set its core streets on a new path is at hand. This NACTO Cities for Cycling Roadshow convenes staff, decision-makers, and experts from successful peer cities to seize this opportunity. The Roadshow will be divided into four components: an interactive Designing Better Bikeways workshop for City of San José staff, a City Leadership for Bicycling session for program and civic leaders, two public evening events, and an in-depth technical meeting of the NACTO Cities for Cycling group, including San José and its peers cities. In addition, a pop-up protected bike lane project will highlight the potential to transform downtown streets. The Designing Bikeways Workshop on Wednesday Aug. 9 will cover the latest in cutting-edge design techniques for better, safer, and more inviting on-street bicycle infrastructure. Peer city practitioners will share how they are designing for the broadest range of people bicycling and achieve sustained growth in bicycling as a travel model. This track will engage primarily technical staff at the project and staff management levels to build knowledge of innovative designs and materials. The training will include hands-on design exercises for project corridors in San José, as well as a destination lunch and site visit. On Thursday Aug. 10, leaders from civic organizations and city departments are invited to learn more about successful bicycling and street transformation programs from guest cities, and to seek out and discuss opportunities for transforming the Capital of Silicon Valley into a leader in active mobility.